I had forgotten what the holidays smelled like til I made these scones. The aroma of pecans sautéing in butter or baking in custard for pecan pie is the essence of late December for me. But, summer also smells like pecans sautéing in butter because everyone knows the best flavor of ice cream is buttered pecan. I guess us Texans are just pecan eatin’ people. Bake these for a romantic Christmas morning before all the relatives come to your house, and enjoy them peacefully with coffee. Or, bake them the morning before a big Christmas shopping trip because they will comfort you as you drive all over town looking for the perfect gift for everyone on your list. You will miraculously not be annoyed at traffic, or stores that have not restocked their merchandise since Black Friday, or even the lady who pulls out the pepper spray in line (did y’all hear about that??). I promise they’ll keep a smile on your face til lunchtime. After lunch, though, you’re on your own. I recommend cupcakes. Preheat the oven to 400 and grease a small cookie sheet. In a small skillet, melt 1 tablespoon of the butter with the pecans. Let toast slowly over low heat until they are fragrant. When done, remove from heat and let cool. In a medium bowl, whisk together the flour, baking powder, salt and sugar. Add the 2 1/2 tablespoons of cold butter and work it into the flour using your hands or a pastry cutter. When the butter is the size of rice grains and is evenly distributed throughout the flour, add the cream. Stir together lightly, then add the buttered pecan mixture. Dump the mixture out onto a floured board and need no more than 10 times to make the dough come together. Form a 6” long rectangle, cut it in half, then place on the baking sheet 5" apart. Brush with extra cream and sprinkle with coarse sugar, if desired. Bake for 15 minutes. Can I ride around with you and go shopping while you feed me these? Please? heck, i’d ride in the truck if i could get in on that action! hmm that was kind of supposed to say ‘trunk’. sounds incredible, just like the ice cream! I kind of just love buttered anything:-) These would be a huge hit! you’re the second blog in 5 mins to bake with pecans that I’ve visited..that’s a message for me to go pick some up. yum! these look great! Totally bookmarking this. Looks so good!! Love a good buttery scone for a breakfast treat! These look perfect! Buttered pecans, you are speakin’ my language. Well, there you go. I was just wondering what types of scones to make for Christmas breakfast this year and now you’ve helped me figure it out! Can’t wait to try these! Mmmm . . . I can just smell them! I adore scones. This looks like a lovely and simple recipe. Beautiful! that looks so soft, edible, and yummy, buttery! Really love your recipes and blog, it’s a great way of having just the right amount of dessert lying around at home. There is a very good chance I’ll make these for Christmas morning…you don’t have to try hard to talk me into anything with “buttered pecan” in the title! I am not a fan of butter pecan ice cream, but I do like pecans and butter. These look like delicious scones! You are so funny and these babies would be tasty and on time all day long! Mmm how incredible these must taste. I picked up some ingredients to make scones 3 weeks ago and still haven’t gotton around to it. 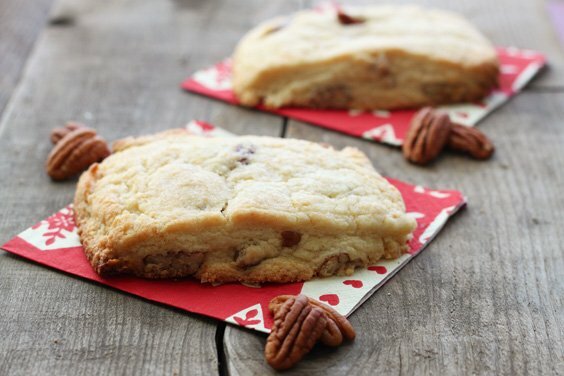 These sound so awesome…I’m such sucker for buttered pecan anything! I was thinking these scones would taste wonderful with a side of that butter pecan ice cream… :) Thanks for another delish recipe, Christina, and for your delightful commentary with it! I plan on making some of your cupcakes this week – hopefully tomorrow! Can’t wait!!! My favorite ice cream flavors are butter pecan and pralines and cream! I had no idea Texans love their pecans! Pecans totally smell like Christmas! When I saw these lovelies on instagram, I instantly knew I had to make them. Am making my 12 days of Christmas baking list and these will definitely go on them. Thank you for sharing such a lovely recipe! Oh my oh my! Butter pecan ice cream is my fav! When it is combined with mint chip and fudge and black raspberry cheesecake,… wow, another level. These look wonderful!!! I love butter pecan, I can almost smell the yumminess. 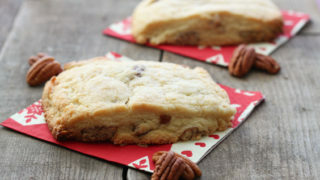 the scones were wonderful and the buttered pecans took the scone to a whole new level of goodness! In this recipe using cream…. What kind is best to use? Hi Christina! I have wanted to make scones for a long time, but was always intimitated by anything with a dough that had to be kneaded. I always have such good luck with your recipes, I knew that was the way to go and this recipe sounded so delicious! Of course, the scones turned out great! And I am feeling much more confident to try again. Thanks for another terrific recipe!